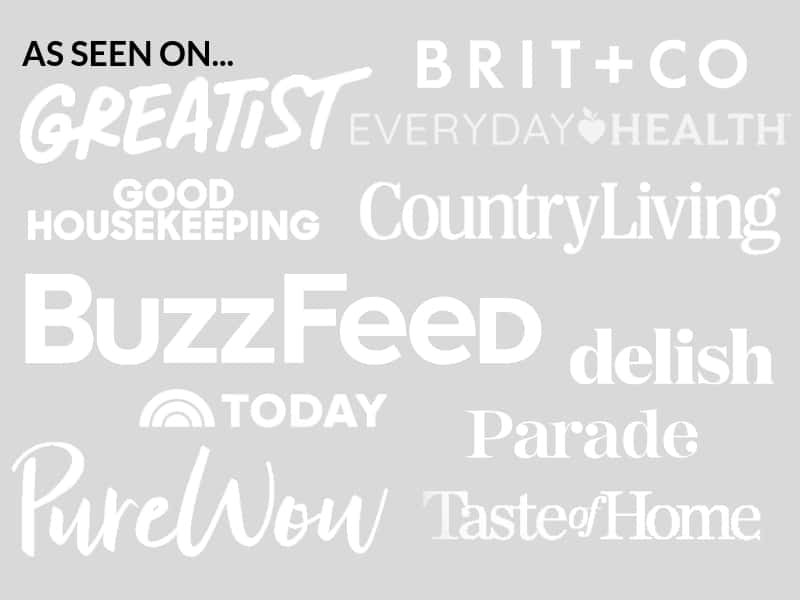 July 5, 2017 By Elizabeth Lindemann 8 Comments / This post may contain affiliate links. “This might be my favorite thing you’ve ever made,” said my husband as he ate this today. Yup, that happened. 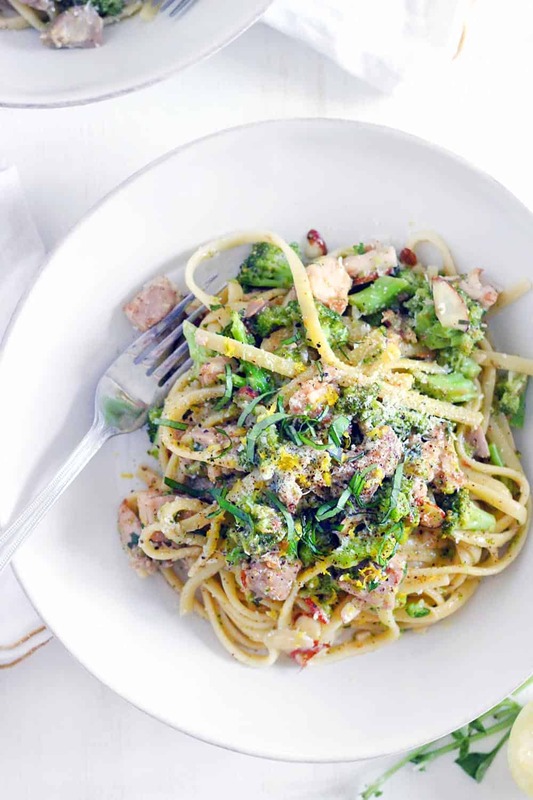 This chicken and broccoli linguine is covered in a thick and creamy lemon butter basil sauce. It’s packed with good for you broccoli. You can make it in 30 minutes. And even though it’s creamy and decadent tasting, it uses NO milk or cream and only two tablespoons of butter for the whole thing! The secret to the creamy texture has a lot to do with the starches from the pasta in the sauce. I’ve been on a pasta kick lately. I’m missing Italian food down here in Texas after living in the Boston area for a long time, so I’m grabbing the bull by the horns and forging ahead with making Italian food myself. Granted, this chicken and broccoli linguine isn’t necessarily a traditional Italian recipe, like my last one (Bucatini all’Amatriciana), but it’s cooked using a similar method. This method ensures that the flavor-packed sauce sticks to every single noodle. Really, the photos don’t do this one justice. Trust me- those noodles are coated in the most delicious lemony, chickeny, buttery sauce imaginable. I recommend using the “nice” pasta from your grocery store for this recipe (read: not the one that costs 99 cents), and for almost all skillet pasta recipes. Bronze cut is best- that means there is a bit of a texture to the pasta, so the sauce sticks a bit better. Bronze cut pasta also contains more starch. Some of the pasta water is added to the sauce to thicken it, and the pasta will finish cooking for just a minute or two in the sauce, absorbing its flavor and imparting its starches into it. For even more creaminess to the sauce, I stirred in some finely grated Pecorino Romano cheese at the end as well as a pad of butter for extra richness. Mmm, mmm. This pasta is seriously delicious. The ingredients in this recipe pair so well together. Chicken and broccoli is an obvious one- who doesn’t love that combo? 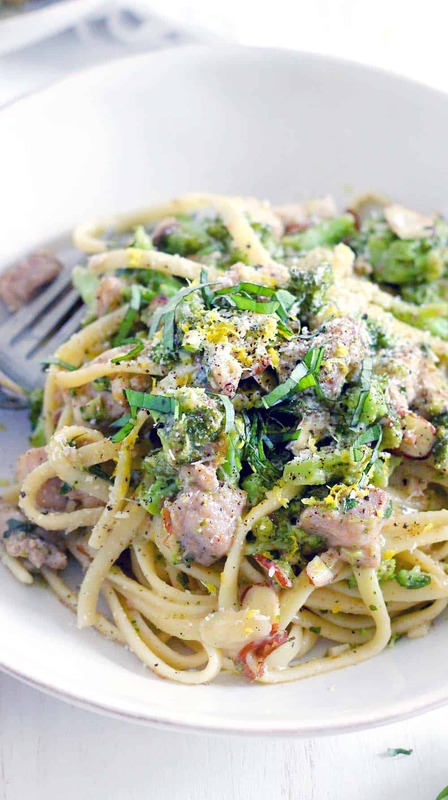 The sauce is super fresh and bright from fresh basil and lemon. It’s rich and salty from the Pecorino Romano cheese. Finally, sliced almonds give each bite a delightful crunch. Plus, the pan is deglazed with white wine after the chicken and garlic is cooked, ensuring all of the delicious browned bits from the pan are incorporated into the sauce. Don’t drink wine? No problem- just use a little extra chicken broth instead (see recipe notes). One final note: I love me some whole wheat pasta, but for this recipe, I used regular white pasta. White pasta is starchier, meaning the sauce will be creamier. If you choose to use whole wheat pasta, be prepared for a less creamy sauce. 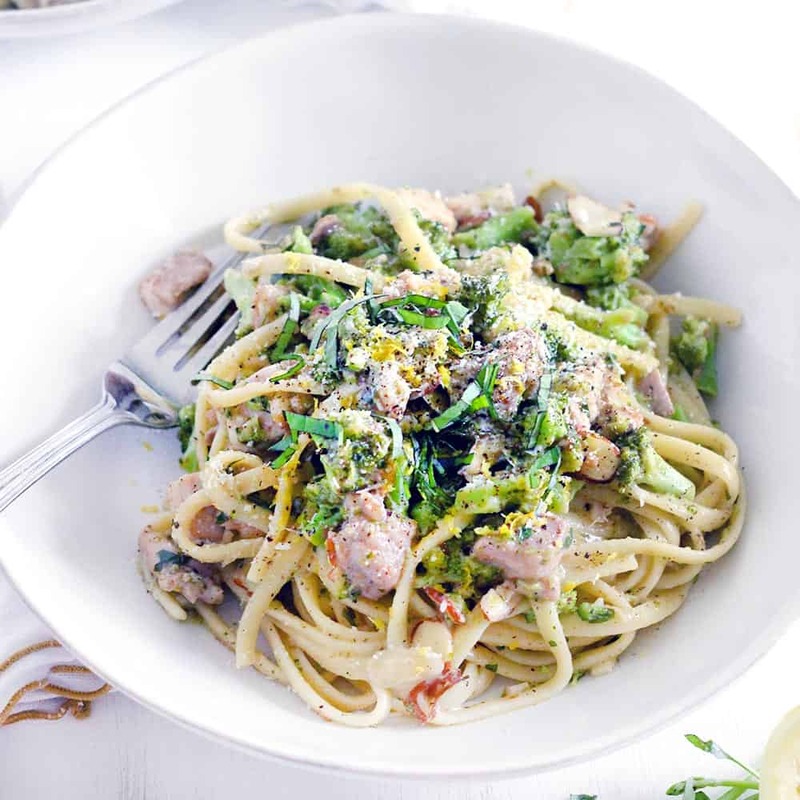 Here’s the printable recipe for chicken and broccoli linguine with lemon butter basil sauce! 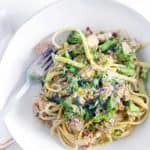 This chicken and broccoli linguine with lemon butter basil sauce recipe is creamy without any milk or cream. Full of bright, fresh flavor and packed with good for you broccoli. Cook the pasta according to directions in a large pot of salty water. 3 minutes before it's al dente, remove 1/2 cup pasta water and reserve for later. Add the broccoli florets to the water and boil with the pasta. Drain the pasta and broccoli until it's almost cooked, just before al dente. Meanwhile, season chicken liberally with salt and pepper, as well as the zest from the lemon. Sauté the chicken in a large skillet over medium high heat in 1 tablespoon butter and 1 tablespoon olive oil, until browned and fully cooked. Don't worry about it sticking to the bottom of the pan. Remove the chicken and set aside on a plate. Add the garlic to the pan and sauté until fragrant (about 30 seconds). Add the white wine to the pan to deglaze it, using a wooden spoon to scrape up any browned bits from cooking the chicken and garlic. Turn heat to medium and simmer until almost all of the liquid from the wine is gone. Add the drained pasta and broccoli, as well as 1/4 cup reserved pasta water. Continue cooking over medium heat until sauce thickens and pasta cooks all the way through- about 2 minutes. Add the cooked chicken back in. Remove from heat and stir in lemon juice, remaining 1 tablespoon butter, fresh basil, Pecorino Romano cheese, and almonds. Stir until cheese has fully melted. Serve with extra cheese, lemon zest, fresh basil, and/or pepper. Instead of wine, you can use 1/4 cup extra chicken broth. I used fresh broccoli florets, but frozen can also be used. While I specified 4 cups, the specific amount is not too important, so go ahead and throw the whole bag in if you want to! This was really good. Fresh and light. My husband thought it needed more basil and I thought it could use more cheese but those are individual preferences. We had leftover lemon rosemary chicken breasts so we sliced one up into bite sized pieces and added them to the sauce when the chicken broth went in. Very good. I originally thought I would use pine nuts instead of almonds then forgot and I’m glad I did. The almonds were just right. So glad you and your husband liked it! I agree about the almonds- honestly I used to use them just because they were cheaper (in this recipe, pesto, and other recipes that called for pine nuts) but I’ve grown to like them even more than pine nuts- I like their crunch! I’m going to make this for dinner, but there’s one thing I’m confused about. You said to reserve 1/2 cup of the pasta water, then later on it says to add back in only 1/4 of it. What do I do with the other 1/4? Thank you! And yes, we loved it! Only change I made was I used a different kind of pasta. But the rest I made like u said. SOOOOO good!! I made this tonight, and it was delicious! When do you recommend adding the cooked chicken back into the dish? I added it back with the cooked pasta/broccoli mix. Thanks so much for bringing this to my attention! Looks like I must have forgotten that step. I added it right after you did, after the sauce had thickened a bit. So glad you liked it! Thanks so much! My picky-eaters and husband all devoured this and declared it their new favorite dish!